These yummy whole-wheat pancakes made with cottage cheese are packed with protein. A satisfying way to start your day! 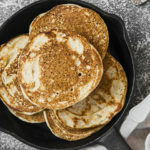 These yummy whole wheat pancakes made with cottage cheese are packed with protein. A satisfying way to start your day! Place cottage cheese, eggs, flour, oil, salt, and extract in a blender or food processor; cover. Blend until smooth. Add milk slowly to reach batter consistency. Heat a large nonstick skillet lightly coated with spray over medium-high heat. Ladle ¼ cup batter for each pancake; cook for 2 to 3 minutes, or until bubbles cover the top. Flip; cook for an additional minute, or until golden brown. Repeat with remaining batter.